It is 5.45am, and I am huffing and puffing my way to the concrete road near Thannirbhavi beach in Mangalore on a bicycle. I am to meet a spunky champion of a boy who has this big hairy audacious goal of winning an Olympic medal in…wait for it…ice-skating! A dream that’s next to impossible for an Indian; one that borders insanity for a person who hails from this hot, humid city where the only ice we know goes well with our drinks. 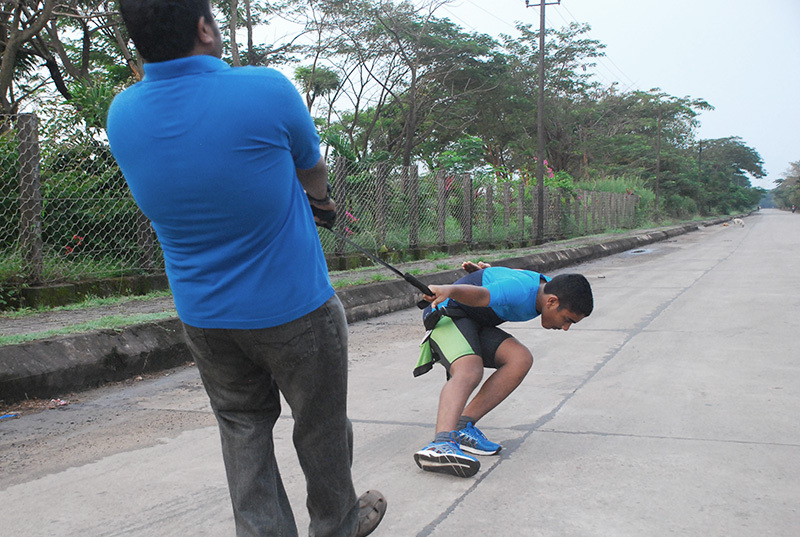 So, does this boy stand a chance in achieving his dream – something no Indian has done before – training on concrete roads in sunny Mangalore with his father as a coach? That’s exactly what I wanted to find out too. This is his story. I’d told his father that I would meet him during their early morning workout session. I get to the destination around 6.20am; 20 minutes later than what I’d promised (I should’ve taken the car). Sure enough, I see the father-son duo engaged in their rigorous daily workout session. Rajeev-the father-is a close friend of mine and Niranjan-the son-is the hero of our story. I get off my cycle, drenched in my own sweat, and walk towards the duo. The father has got the son on some kind of a leash knotted at his waist. The son, crouched and bent forward, is trying to walk sideways dragging the father along. I start a conversation with the father. ‘So what is this for?’. ‘This is to strengthen the muscles for those tight turns he will have to take in the rink’, he says, ‘Would you want to hold the ropes?’. I say I can give it a try and take over from the father. Almost immediately, I get swept off my feet by a tug from the champion, and I try to hold my ground. I get a hang of how it is done and proceed to complete a lap. ‘How did I do?’, I ask the son. ‘You did ok. Was a bit jerky though’, he says matter-of-factly and gets on with his next set of exercises. I am tired from all the cycling, pulling and tugging. The father and I decide to take a break and have some tea from a nearby shop. As we walk, the father talks to me about their journey. 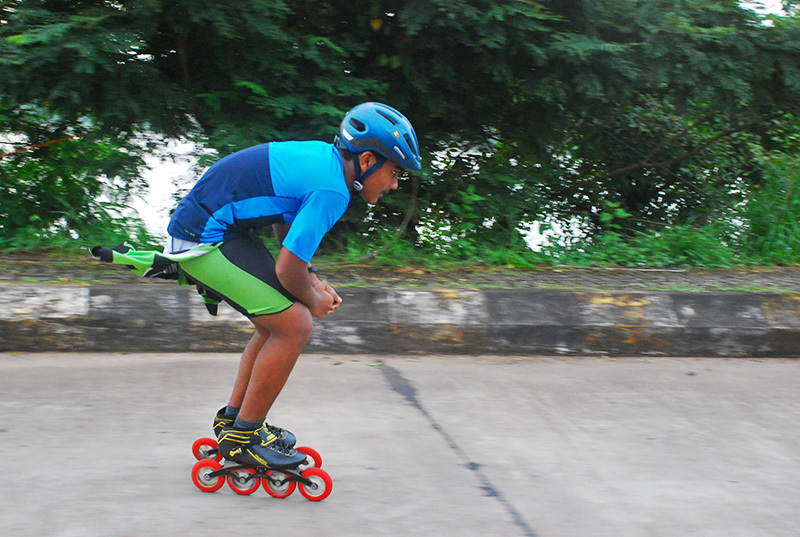 It all started when Niranjan was all of 7 years of age and got introduced to roller skating in school (Lourdes Central School, Mangalore) as part of their extra-curricular activities. What started off as an interest soon grew into passion. Rajeev, realizing that the boy had it in him to scale great heights, enrolled him in a roller-skating coaching school, and started encouraging him to do more. The boy responded well. Within 3 years, as he moved up from the basic 4-wheel roller skates to Quads and then inline, he also had started winning medals at various school, state and zone level championships. It was going well for him in the roller skating arena. 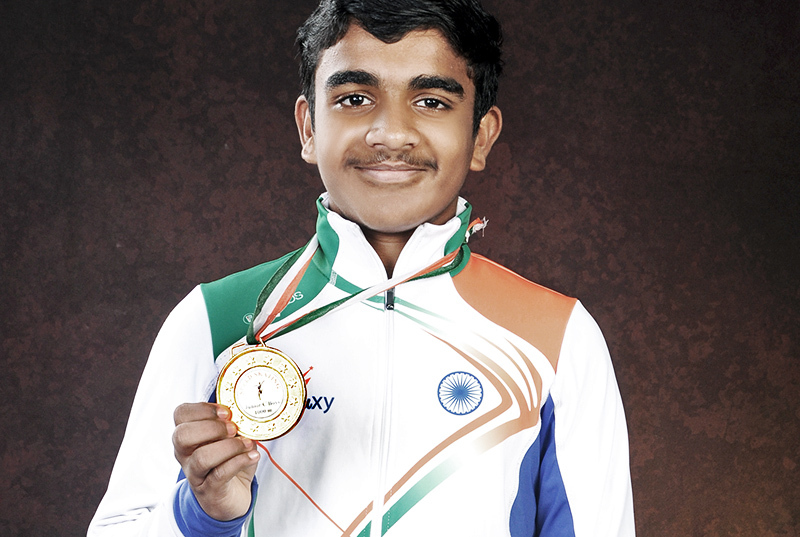 However, in the 2015 state championships, though he came in second best in Karnataka, he was disappointed with his performance as he had been working hard for the top honours. It was at this time that Rajeev came to know about a 10-day ice skating camp to be held in Gulmarg (National Short Track Speed Skating (STSS) Camp). He thought that this would be a good break for his son. Little did he know that this would be life-changing decision for him. 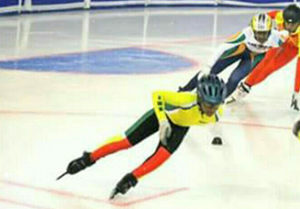 Niranjan did well in the camp, and qualified for the National ice skating championship (XIIth National STSS). He went on to win a bronze medal there. A medal in the first ice skating event that he participated (1000 mtrs STSS)! The duo was overjoyed, and Niranjan decided to take up ice-skating more seriously. Unbeknownst to Niranjan, one of the people watching his impressive performance was the head coach for Short Track Speed Skating Team India, Avadhut S. Tawade. Avadhut had moved back from England to India with a dream of developing an ice-skating Olympic champion from India. Avadhut asked Niranjan to come for another camp to be held in Delhi (STSS conditioning camp for National Team). Niranjan did well there too. After the Delhi camp, Niranjan was selected for the Indian National Short track speed skating team (Junior D, below 13 years). There was no looking back from there. Niranjan kept improving his performance with every camp and competition. He was selected for the STSS training camp held at Erzurum, Turkey. He then finished with a Silver medal in Men’s Relay at STSS Turkey – India friendship cup conducted at Palandoken Olympic ice rink, Erzurum, Turkey. He won the Under 15 National championship (XIIIth Nationals STSS at Delhi) in Dec-Jan 2016-17 (Junior C Champion by winning a Gold medal in 500 mtrs). He attended a camp in Belarus and competed in Belarus Open Cup no. 1, held in Minsk Arena, Belarus where he clocked his personal best of 51.6 secs in 500 mtrs and 1 min 47 secs in 1000 mtrs. He won second place in 1500 mtrs Finals-B and third place in 1000 mtrs Finals-B. After this he participated in the Under 15 National championship (XIVth Nationals) again in Dec-Jan 2017-18 and retained his national champion (Junior C) status. I ask Niranjan what his ultimate ambition is. He answers with a lisp: ‘to be the first Indian ice-skating Olympic champion’. In any of the International skating union officiated championships, he will have to do 500 mtrs in under 51 secs. This will qualify him for the Junior World championship (Below 19 yrs.). Here he will need to do 500 mtrs in under 47 secs, which will qualify him for the World cup. There are 8 world cups, and he will need to participate in at least 6 of them. Total points from these World Cups are consolidated and athletes are ranked based on total points. The top 32 athletes will get to participate in the Winter Olympics. Niranjan is currently in stage 1. In the recently concluded championship in Philippines, his timing was 50.89 secs. He won 4 golds (33 mtrs, 777 mtrs, 500 mtrs and Relay) and 1 overall championship medal. He intends to better at the next championship to be held in Jakarta. Now if you’re thinking that he is doing well, consider this: even the best skater in India has only managed a timing of 43 secs (for 500 mtrs). To even be competitive in the Olympics, Niranjan will need to break 41 secs. To win an Olympic medal he must aim for under 39 seconds! His route to an Olympic ice-skating medal will take a lot of hard work, better equipment and training facilities. The journey has not been easy for Niranjan, and it is going to get a lot harder going forward. Being in Mangalore, he has had to keep up with a strenuous workout routine utilizing the scantiest of resources, fighting adverse weather conditions. Continuous absence from school and catching up on notes, learning the topics by himself have all become a norm for him. Adding to his woes is the fact that ice-skating is an expensive sport to pursue. Securing the right gear and footing the bills for his travels have been burning a deep hole in his parents’ pockets. Despite all these limitations, can he beat the Koreans, the Canadians and the other traditional ice-skating champions to get India a medal? I would bet my money on him, since I have seen his grit and determination from up close. But it will take a lot more than merely his father’s support to get there. *** Update: This post was picked up and published by TheBetterIndia on Oct 26, 2018. Many thanks to them for helping this article reach a wider audience. *** Update: This post also appeared as cover story in one of the recent print editions of Daijiworld Weekly – a Mangalore based global magazine. Good luck Niranjan… No dream is too big. Very well written sampath! Amazing grit! All the best Niranjan. Well written Sampath. Atb Niru 👍. India knows you can do it ! !